Just over a year ago, the Florida Forestry Service stood by as flames engulfed the Warea Tract - a 40-acre portion of Seminole State Forest that the agency is responsible for maintaining. Apparently, this prescribed burning was just what the doctor ordered. Earlier this month (October, 2011), Jackie Rolly and others had the privilege of counting approximately 1,158 specimens of Warea amplexifolia (commonly known as “Wide-leaf Warea” or “Clasping Warea”) on the site. 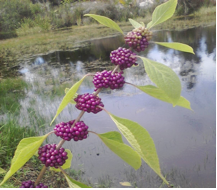 This plant, endemic to central Florida, has remained on the Federal Register of endangered plants since its listing in 1987. Additional endangered plants that Rolly and her group identified include Lewton’s Milkwort (Polygala lewtonii), Trailing Milkvine (Matelea publiflora), Scrub Plum (Prunus geniculata), and Scrub Morning Glory (Bonamia grandiflora). Habitat loss is the primary threat to this species. Sadly, only a handful of W. amplexifolia populations remain within its historical range. Of the extant populations, only two others are similarly located on land that is protected from development. 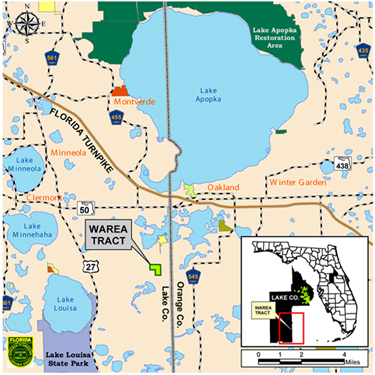 For this reason, the Warea Tract is not open to the public, but FNPS members are always welcome to assist with monitoring and counting. 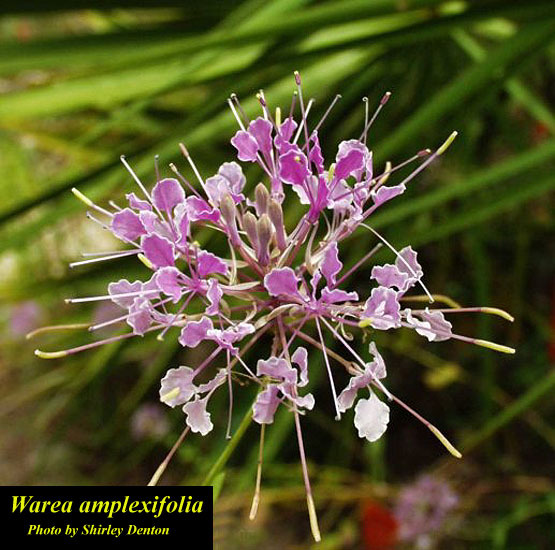 Clasping warea is known or assumed to have been extirpated from several sites in Orange, Lake and Osceola Counties. Its preferred habitat - dry, open, upland Pinus palustris woods underlain with well-drained, white sandy soil - has been largely usurped by groves of citrus from Leesburg to Haines City. Populations of the plant in areas including Orlando, Tavares, and Leesburg are isolated and vulnerable to the pressures of development. W. amplexifolia, a member of the Brassicaceae, is a herbaceous summer annual that typically reaches 3 feet in height, with slender, branching stems arising from an elongate tap root. Its leaves are alternately arranged and are generally heart-shaped with conspicuous basal lobes which clasp the stem (hence its common name). Its pale purple flowers are showy and are borne in small, rounded, puff-like clusters at the ends of the branches. 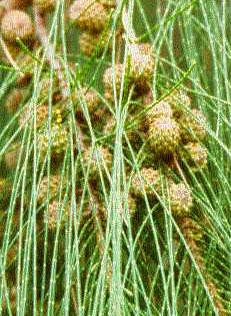 Reproduction is exclusively sexual by the production of seeds, which are probably released from its fruit, a dehiscent silique, by wind action. The small seeds generally fall near the parent plant. 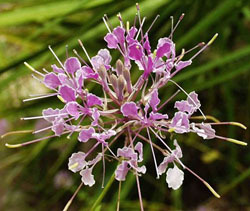 A full description can be found at http://www.fws.gov/northflorida/Species-Accounts/Wide-Leaf-Warea-2005.htm. The plant's attractive flowers predispose it to being picked by vandals and curios passers-by, and taken for use as a cultivated ornamental. Additionally, because this species is an annual, and extremely restricted in both range and numbers, it is vulnerable to disturbance and natural disasters. The failure of any one of the remaining populations to set seed in the fall could result in the extirpation of that population and a further reduction in the already small genetic variability of the species. Should you happen to find this plant in an undocumented area, please contact Juliet Rynear, FNPS Conservation Chair, at http://www.fnps.org/committee/conservation.